"Extra organic growth to anticipate the future"
At first it was organic that was growing fast in greenhouse vegetable cultivation, but now the largest growth in the Benelux happens in open field cultivation. 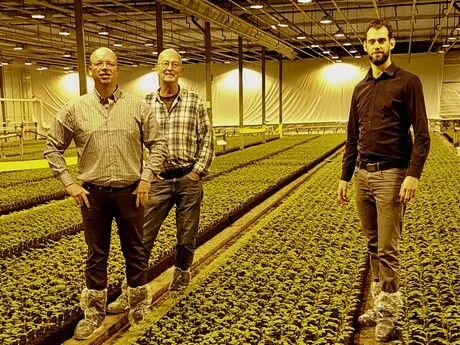 Arjan Sonneveld, representative for both greenhouse vegetables and open field cultivation at Grow Group BV and Grow Bioplant BV: "Organic has the future, and we see more people switch from traditional agriculture." Grow Group is present at the Bio-beurs in Zwolle (Netherlands) on January 23 and 24. Arjan Sonneveld, Simon van Zanten and Wilco Meuldijk among the tomato plants at the completely organic location in Naaldwijk. Grow Bioplant BV has been active in organic growth for over twenty years. Arjan: "4,000 square meters and that greenhouse half-filled, that was 'organic' back in the day." That has changed now, because in Naaldwijk Grow Bioplant BV has over 4 hectares of greenhouse, solely intended for organic cultivation. "For more and more organic certificates worldwide, that is a requirement. You are not allowed to partially use the greenhouse for regular cultivation." Grow Group has nursing certificates of Bio Suisse, Naturland, and USDA. Grow Bioplant BV is also SKAL certified, enabling the company to sell biological plants all over the world. The requirements for SKAL are not as strict though as some other international certificates. "SKAL (still) allows simultaneous cultivation of organic and regular in the same greenhouse. Not at the same time, but one after the other." Grow Bioplant BV would like to see that differently. In total, Grow Bioplant grows 33.1 million 'cold plants' and 3.6 million 'warm plants'. Organically grown sweet potato and strawberry from the open field are the new spearheads of the company. At the moment, Grow Group is faced with the limits in regulation for growing strawberries. "We can grow completely organically, but no other nursery is offering this yet. This would mean that we would have a monopoly if SKAL requires a completely organic nursery." The expansion of the assortment is good for Grow Bioplant BV, because the special organic location in Naaldwijk can be better utilized. But a broader assortment is even more important for the growers. "To grow organically in a system based on soil rest, sufficient different crops have to be available." Arjan hopes, together with his new colleague Wilco Meuldijk and Simon van Zanten, to meet a lot of growers at the exposition to hear what their experiences and wishes are. "In our merger (Grow Group BV and Grow Bioplant BV will merge into Plantise in 2019) organic growth is a spearhead, and now we are focusing extra on the open field, we can pioneer with the growers like in the old days."